WASHINGTON--(BUSINESS WIRE)--Today, Oceana released a new report highlighting the ability of Global Fishing Watch to provide a clear view of fishing activity in marine protected areas (MPAs) around the world. Specifically, the report shows that Global Fishing Watch can monitor the success or failure of policies aimed at controlling fishing activity in protected areas. 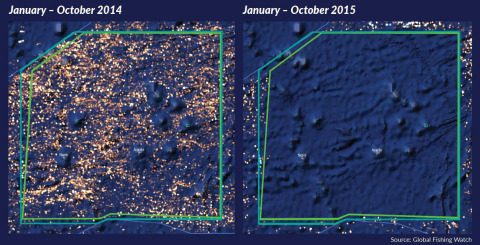 Using Global Fishing Watch, the product of a partnership between SkyTruth, Oceana and Google, Oceana documented the apparent success of the Phoenix Islands Protected Area (PIPA) by showing a drastic reduction in detected fishing activity following new regulations that established it as a no-take area. New report highlights the ability of Global Fishing Watch, a partnership between Oceana, Google and SkyTruth, to provide a clear view of fishing activity in marine protected areas around the world.